Good morning stampers! It's Saturday...YES! The weekend is here!!! And more...it's our weekly Technique Challenge inside Stamping and Blogging. Get your favorite Stampin' Up! Classic Ink pad, I went with Tip Top Taupe to keep it neutral. Stamp on watercolor paper. I'm again featuring Butterfly Basics and it's floral image. While the ink is wet (as it's water-based), use your Aqua Painter and start to color in certain parts of your image (use the ink from the outlined stamped image). Want to learn how to use the Simple Sepia Technique? Want to know how I learned? 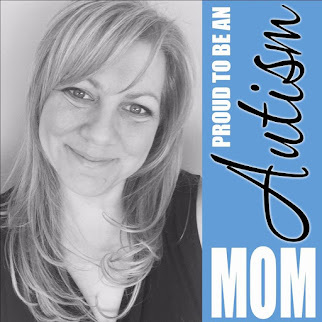 By watching Sandi's videos! It's posted today to kick off our Technique Challenge this week inside Stamping and Blogging. It's actually a very simple technique and you need 1 ink pad. 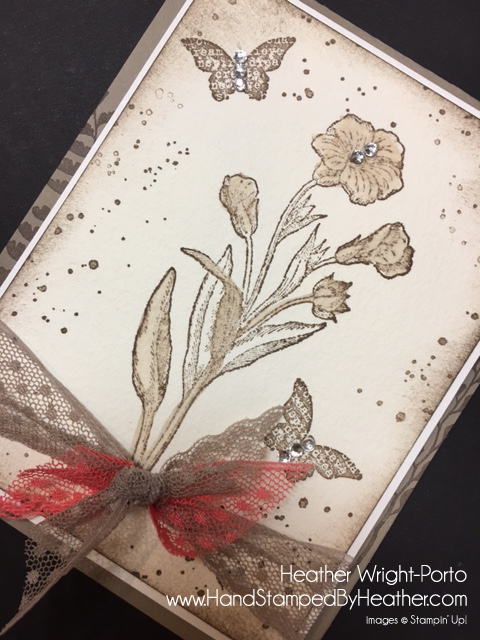 Everything stamped on my card this week is in Tip Top Taupe. Some of the lighter "dots" is because I also used the Stamp Off technique (stamped off on scrap paper before stamping my card). Oh...and you'll see the Sponging Technique as well! When finishing with the Sepia image, I think stamped two butterflies. Then from the Gorgeous Grunge stamp set, I stamped some dots around the outside to frame the image. Lastly, I added sponging around the edges, again with Tip Top Taupe. Next, I mounted the focal panel on Whisper White card stock allowing for a 1/8 inch mat. Tied Tip Top Taupe dotted lace ribbon around the focal panel, and before knotting, added a small piece of Watermelon Wonder lace ribbon to add a little splash of color. 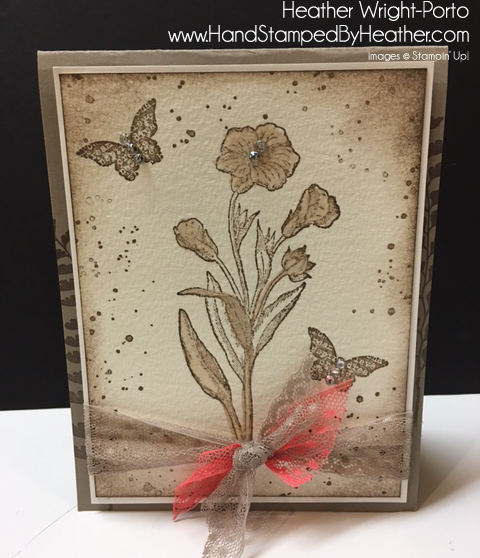 Next, stamped the fern image from Butterfly Basics onto the card base (in Tip Top Taupe). 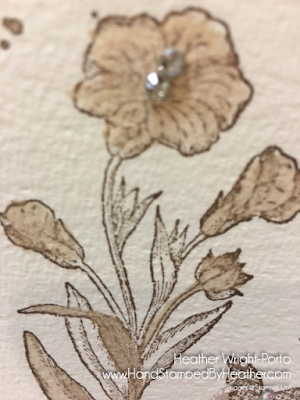 The card base paper is Sahara Sand. To finish, adhere the focal panel to the card base with Stampin' Dimensinals, and add your bling (Rhinestone Jewels)! Want to see more Sepia? My partner Sandi MacIver, does some amazing card right? If you haven't checked her out, click here to view this week's Sepia card and to poke around her site for more and more goodies. Want to see more cards featuring Butterfly Basics? Click here to see all mine :D It's my favorite stamp set, so I have a bunch for you to look at! Don't forget to get your FREE gift from us! It's an 8-set video series that every stamper needs to know, plus more exclusive PDFs, Videos, tips and more when joining our mailing list. We very much appreciate YOU and it's our special "Thank You" for supporting us too!